China Southern Airlines has become the sixth airline group in the world – and the first outside the United States or Europe – to transport over 100 million passengers a year. Founded only in 1988, China Southern reached this milestone in 2014 faster than the other groups carrying over 100m passengers: American Airlines, Delta Air Lines, Lufthansa Group, Southwest Airlines and United Airlines. Ryanair expects to carry 97m passengers in 2015, likely leading it to carry 100m shortly thereafter. The Air China and China Eastern groups are expected also to cross the 100m mark. Fast growth at the HNA Group could also see it carry 100m passengers around the turn of the decade. This would be impressive given the group has limited public capital, but would also give China four groups with over 100m passengers, matching the US. China Southern is big, but this fast growth, partly organic, partly through merger, has come at the expense of efficiency. It may have the highest growth prospects but it also has considerable work ahead to become agile. It could also have the most at risk as its core domestic market faces new competition while long-haul performance continues to lag. The Lufthansa Group crossed the 100m passenger threshold in 2011, making it the fifth airline group to do, and the first outside the US. US airline groups have been carrying over 100m passengers for some time. Delta in 1997 became the first airline in the world to carry over 100m passengers a year. Southwest crossed the point in 2007, making it the first low-cost carrier to do so. While China Southern has been fastest to go from launch to 100m passengers, both China Southern and Lufthansa took seven years to increase from 50m to 100m passengers. Note: Group names shortened. 2014 traffic projected for all airlines except China Southern. United traffic from 1995 to 2005 is only for mainline operations. 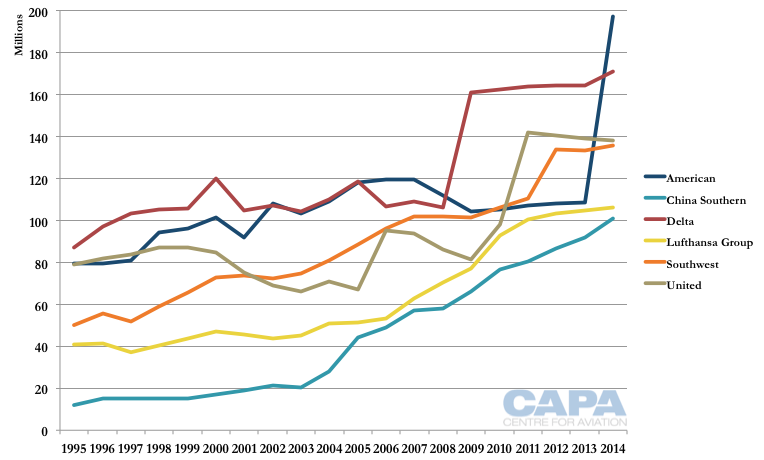 American traffic from 1995 to 1997 excludes American Eagle. China Southern's growth has been extraordinary. The airline was founded in 1988 and crossed the 10m mark in 1994. It was not for another eight years that it would reach 20m passengers, but then began to reach a milestone every year or two (and sometimes two in one year, as China Southern grew from 28m passengers in 2004 to 44m in 2005). The current Guangzhou-based China Southern group (China Southern Air Holdings) includes flying brands China Southern, Xiamen Airlines and Chongqing Airlines. China Southern in 2003 acquired China Northern Airlines and China Xinjiang Airlines in 2003 and the brands disappeared whereas Xiamen and Chongqing Airlines are still active brands (and are not wholly-owned by China Southern). Those acquisitions pushed China Southern's traffic up steeply in the graph above, and the legacy continues: China Northern was based in Shenyang while China Xinjiang was based in Urumqi. China Southern is the largest airline in both of those cities. China Southern's small portfolio of airlines make it one of the smaller groups in China compared to Air China and HNA, which have a number of airlines. Over 75% of passenger numbers at the group are generated by China Southern Airlines, China's largest overall and in the domestic market (but not international, which it is quickly building). 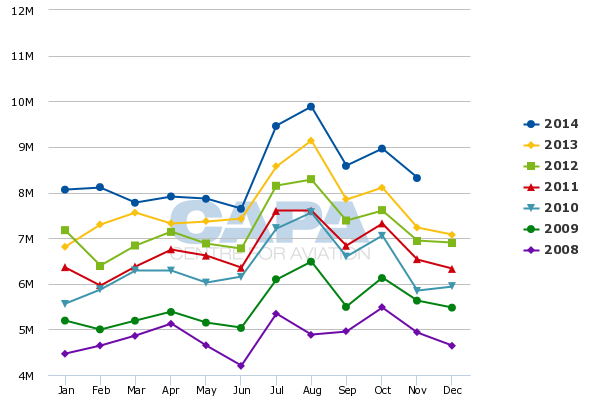 Since 2008, the group has recorded a monthly year-on-year traffic decrease in only one month, Jan-2013. The balance of the traffic is mostly held by Xiamen Airlines, which has surpassed a 100-aircraft fleet. Xiamen is considered one of China's better run airlines and China Southern has been learning from Xiamen, which by its metrics is the world's most consistently profitable airline. 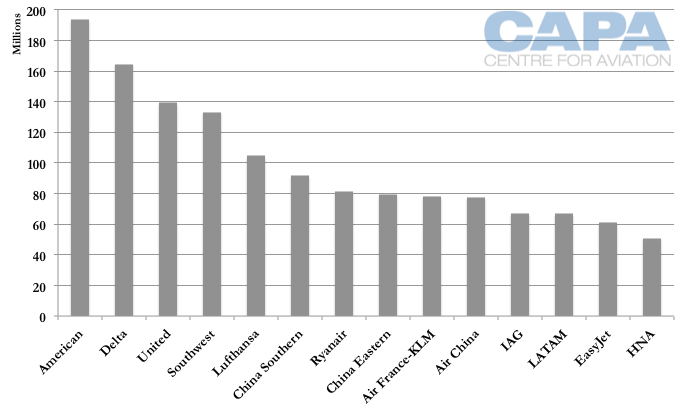 As with the Lufthansa Group, it is not the flagship airline (China Southern) that is the most solid performer but rather one of the smaller carriers (Swiss and Xiamen respectively). Xiamen is taking six 787s to establish a token long-haul network. In 2014 Xiamen acquired Hebei Airlines, boosting China Southern's presence in the start-up rush in China, and expanding its footprint across the country. 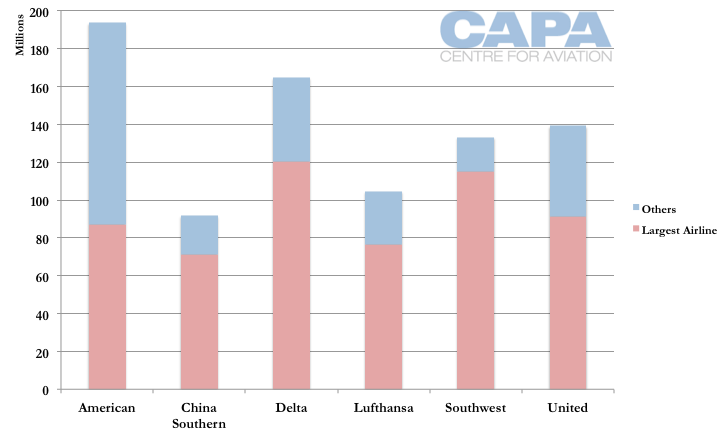 Looking at the traffic composition of the groups, China Southern is closest to Lufthansa in size and distribution where the main airline (China Southern Airlines and Lufthansa Passenger Airlines) accounts for about 75% of traffic. These proportions are similar to the much larger Delta and United groups. Southwest's traffic for 2013 in the graph below is comprised of Southwest and its smaller acquisition AirTran. AirTran performed its last flight in Dec-2014 and henceforth all traffic will be under Southwest. Likewise American's traffic is comprised of mainline American Airlines and US Airways and their regional units. The combined American Airlines and US Airways mainline traffic will be around 10m passengers greater than the combined Southwest/AirTran traffic. American Airlines mainline accounted for 45.3% of enplaned passengers in 2013 while US Airways was a smaller 28.4%. Once merged, the two mainline operations will comprise 73.8% of enplaned passengers, in line with other groups seeing about 75% of traffic from their largest brand. Nine airline groups are known to have ended 2013 with between 50-100m passengers, including China Southern. Ryanair, China Eastern, Air France-KLM and the Air China groups were all around the 80m mark. China Eastern carried 84m in 2014 while Ryanair CEO Michael O'Leary expects to carry 96-97m passengers in 2015, having carried 86m in 2014. The Air China and China Eastern groups can be expected to carry over 100m passengers this decade. AF-KLM has said that total ASK growth for the group will in the range of 1-1.5% per annum in 2015-2017, but this varies significantly by segment: Transavia will achieve double digit growth (which could quickly boost passenger numbers given its short-haul nature) while the hub feed traffic will be flat, short- and medium-haul point-to-point capacity will be down and long-haul capacity will be up 2% per annum. IAG plans ASK growth at a CAGR of 3-4% per annum to 2020, but short-haul Vueling will be much faster. IAG could acquire Aer Lingus, which in 2013 had 9.6m passengers, providing a boost to IAG's 67.2m. EasyJet's fleet plan will have it growing at 6% per annum on average to 2019. Passenger growth should be similar or slightly higher as it increases A320s in the fleet (compared to A319s). The expansive HNA Group had just over 50m passengers in 2013 but is undertaking ambitious growth at nearly all of its airlines (including LCCs West Air and HK Express) while launching new ones (including Fuzhou Airlines and Urumqi Airlines). This HNA figure is calculated based on its core Asian carriers and does not include Aigle Azur in France or Africa World in Ghana. A number of airlines in 2014 are expected to carry around the 50m passenger mark, including AirAsia, ANA, Emirates and Turkish Airlines. Depending on its growth relative to easyJet, AirAsia could be the next LCC group after Ryanair to reach 100m passengers. Lion Air's disclosed traffic figures (38m for the group in 2013) place it smaller than AirAsia but this could change given its large aircraft order book. While Emirates may not have 100m or even 50m passengers, it is already the largest international airline based on passenger kilometres. Meanwhile the new American Airlines group will be the first to carry over 200m passengers when it crosses that mark in coming years (depending on growth). The lack of firm passenger traffic projections at European airlines reflects how they are more interested in set ROCE/ROCI rates, as are their North American counterparts. Profits take preference over growth. In contrast, such terms are scarcely heard in the emerging markets of the Middle East and Asia. Growth takes on a higher priority, because in those much more dynamic markets failing to grow in the short term can mean being excluded from the market in the medium term. Asia also has a number of large state-owned airlines as well as airlines part of larger, diversified groups (Hanjin, Swire). Airlines become flagship marketing tools and/or pillars of an economy. The mere existence of Singapore Airlines has arguably done more for the country than any of its profits have – or likely will. China Southern, like other state carriers, has been pushed by Beijing to grow, in order to meet Five Year Plan targets. In recent years this has irritated management as a slowing economy has created a gap with the growth targets handed to them. This is set to change in 2015 with the commencement of the next Five Year Plan. The fundamentals of what Chinese airlines need has not undergone drastic change since China Southern's 10 million passenger mark in 2004. Marketing, especially internationally, is weak while state interference is present, reducing the opportunities to improve efficiency. But like the difference between 10m passengers and 2014's 100m passengers, there has been significant change in the degree to which Chinese airlines need to improve. They have come a remarkably long way. While marketing standards may need improvements (and investment), it is greatly improved, although the casual observer of an airline ad or website may think little has changed. Hard product has come far: long-haul lie-flat is becoming the norm while China Eastern is introducing direct aisle access for business class across much of its long-haul fleet. Airlines note catering costs are increasing due to volume but also quality of meals. They are also very candid in admitting they need to improve. The major Chinese airlines have also joined alliances and gained experience through those. JVs are becoming common. China Southern has said it wants to stop long-haul growth but will make exception for subsidised long-haul routes. To bed down the international network it quickly sprouted, it is seeking partners – and not just in its SkyTeam partnership. China Southern's achievement of the 100m passenger mark at the end of 2014 has unfortunately come at the same time as four executives – including the CFO – have left their jobs amid investigation of a "job-related crime", official speak for corruption charges. That China's anti-corruption drive has turned to airlines, and found irregularities, is unsurprising. There may well be more investigations, and not just at China Southern. To some, this may be the biggest public indicator of trouble at the airline. It may be an image and government problem, but there are wider strategic matters. State interference is holding back efficiency gains, LCCs are sprouting (including 9 Air in China Southern's Guangzhou home) and expanding high-speed rail is a challenge to some degree for China Southern, which has the largest domestic network. Meanwhile China Southern's A380 fleet has yet to find enough profitable routes. These are all challenges that accumulate to a significant body of problems. The upside is tremendous growth potential. China Southern may need the most work of the airline groups carrying over 100m passengers, but it also has the potential to have the highest growth and make the largest impact. China Southern will place greater emphasis on the efficiency and financial target 100m peers already have. This achievement has been a long time coming for China Southern. Some early growth targets were missed but China Southern has been unwavering in what it saw as its destiny to becoming Asia's largest airline and one of the largest in the world – perhaps even the largest. It is quaint to reflect on China Southern's jubilation in past years when it first entered the top 20, becoming the 19th largest airline in Asia and then when it overtook Thai Airways as fifth largest in Asia. Growth will continue to define the carrier, but there will be greater focus on quality. Achieving this combination of size and quality will be a challenge for many airlines. It will also generate an opportunity, and perhaps the necessity, to work together with more established partners.